Blend ginger ale, vodka and drink mix in blender until mix is dissolved. 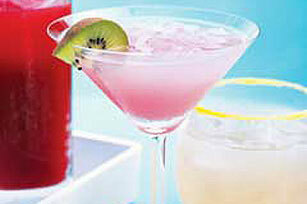 Dip the rim of each glass in water; then dip in colored sugar for a festive look. For a non-alcoholic version, prepare as directed substituting water or ginger ale for the vodka.